Today's entry is a movie that resonated strongly with me because of the time and place it's set in. As someone who grew up in Ireland through the 80s and 90s this one triggered all kinds of memories. 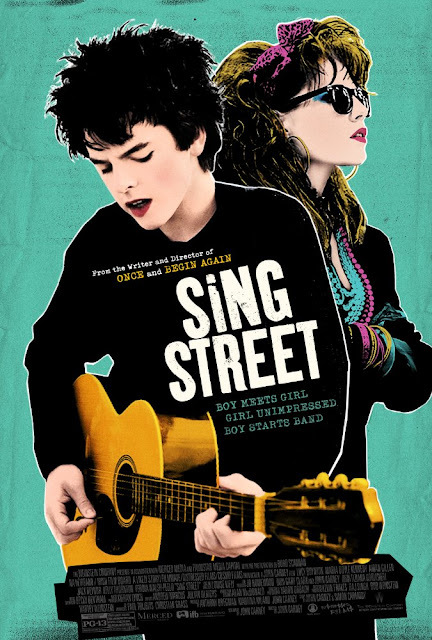 Sing Street is the latest offering from John Carney, the Irish filmmaker who has a knack of making earnest relationship stories that aren't just 'musical', but rather weave the music into the fabric of the storytelling. I loved both Once and Begin Again, as they told stories that might have wandered into saccharine territory in other hands. Both those movies took what appeared to be straight 'romance' stories and delivered believable and compelling characters in modern, often messy, relationships. I see his films as odes to the imperfections of actual, real, romances. Sing Street strikes a slightly different cord. It's more teenage wish fulfillment, but retains the earnest characters, and superb soundtrack. There are again some great original songs, all tinged with the sounds of the eighties, but this time they sit alongside a greatest hits package of early 80s pop. It's fun, well paced, and keenly observed. It's characters are the type of brave that you wished you were in high school. (rather than what probably actually happened) The charm of the film is in how it retains that orbit. It's a pageant of sorts to how powerful music can be to the young (and the young at heart). Anyone who has ever had a crush they desperately wanted to impress will smile, nod, and remember. Even if you didn't grow up in Ireland, this one is still worth catching.